The food industry actually uses food colorings and preservatives to cover up the fact that the minimal amount of real tomato they’re using are rotten. Even worse, rodent fur has even been detected in conventional Heinz ketchup! Unless your purchasing ketchup that is truly organic, with no additional or hidden ingredients, most brands are loaded with chemicals and preservatives. Organic tomatoes versus conventional make a great deal of difference for any recipe that uses them. Eliminating these ever so pleasing toxic condiments can be a bittersweet process. In reality, these condiments can either make or break your meal! Depending on what you’re having, some foods just aren’t the same without ketchup. For example, roasted breakfast potatoes! You just can’t eat those babies (not human) without ketchup. If you’re coming off of the Standard American Diet, the elimination of ketchup may not be your ultimate “freakout,” moment. However, if you are a ketchup fanatic, let me help prevent your, “OMG no ketchup? !” moment. Purchasing an organic option is already so much better for you and your family from the elimination of toxic additives. If you’re like me, and prefer to make your own anything, then I welcome you into my kitchen lab! I’ve learned this fermenting technique through my mentors, and continue to apply their foundations with recipes I create, explore, and experiment with. If you’re a previous (or maybe even still current) ketchup lover, I hope you welcome this savory & slightly hot fermented ketchup! It’s definitely got a great kick! This ketchup is specifically intended to be an anti-pathogenic ketchup. Meaning, this ketchup recipe is loaded with probiotics (good bacteria the immune system needs to be strong), along with herbs that fight against bacteria and viruses. Another “plus” to this recipe is that it also supports the liver and gallbladder with the use of Turmeric! Turmeric is one of the best detoxifying agents for the liver and gallbladder, while also providing anti-inflammatory properties. However, its not that easy to just go out and purchase any Turmeric from any company. I’ll touch on the topic briefly…Most if not all turmeric has been irradiated, oxidized, and is rancid by the time you purchase it from whoever and wherever. With so much gratitude, my mentors manufacture the best turmeric ever! No binders, no fillers, no excipients, no irradiation, no oxidation! Let me know if this is something your interested in by shooting me an email (I’ll have a featured post just solely on turmeric soon to come)! Using Turmeric, Oregano, and Clove are the key to this anti-pathogenic ketchup! Not many people know that clove has incredible antimicrobial activity! Research shows that clove’s antimicrobial potential was seen to kill many Gram positive and Gram negative organisms including some fungi.The antimicrobial activity of clove is attributable to eugenol, oleic acids and lipids found in its essential oils. Remember, food serves the purpose of nutrifying the body. Eating foods that enhance nutritional status and support the immune system are the way to go! As a culture, we have lost touch with traditional practices of preparing foods that support the body. Yes, it requires more time and most of all, planning. However, it is absolutely worth the wait for many reasons! Your food just tastes better! 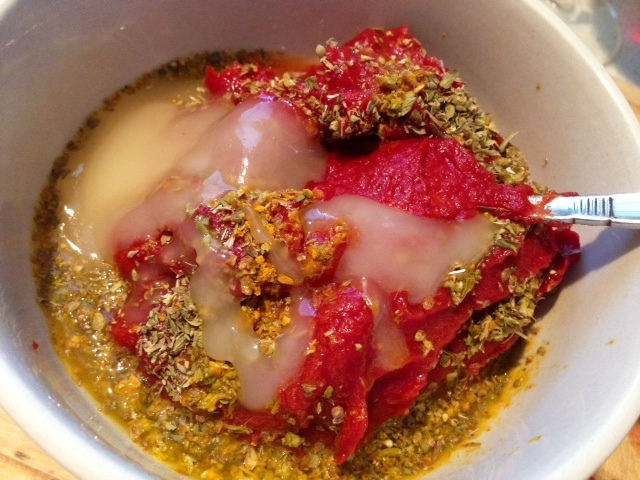 Can turn your foods into healing foods by fermenting them! You can make a difference in health for yourself, family, and friends! I hope this recipe serves as an ignition to your dedication to your health. Enjoy, savor, consume & relax with foods that make your body feel good! If you know you’ll be traveling, camping, or going wherever, you can take this baby with you! Having foods that are a part of your “junk foods past,” can definitely save you and your sanity! 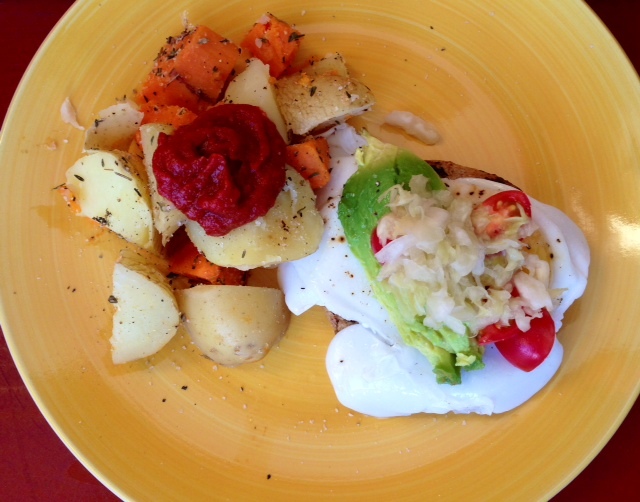 This fermented ketchup is another way to get fermented foods into your daily regime! Remember, supporting the gut ecology with probiotics is key to optimal health! Empty tomato paste into a small or medium sized bowl for mixing. Add in additional seasonings and mix thoroughly so all herbs and spices are blended smoothly. Next, add in raw vinegar to soften the consistency of the soon to be fermented ketchup! Pack ketchup mixture into a glass mason jar. Cover the top of the jar with a cheesecloth or napkin, leaving an inch of breathing room from the rim. Use a rubber band or jar lid to hold the cloth cover in place. Set the jar next to your dehydrator for 24- 48 hours. The best way to determine if your jar is being warmed to the right temperature is to touch it after a few hours. If the jar is slightly warm, you’re good to go. If the jar is distinctly hot, then decrease your dehydrator’s temperature or move the jar at least a 1/2 inch away from it. If you don’t have a dehydrator, let stand in room temperature for 3 – 4 days. I’ve found that for greater results, using a dehydrator works best for your successful batch! Use your newly fermented ketchup condiment for any meal or snack! Once your ketchup is done fermenting, refrigeration will help it keep. The natural anti-pathogenics and honey will help to preserve this beautiful condiment for up to a few months in the fridge. 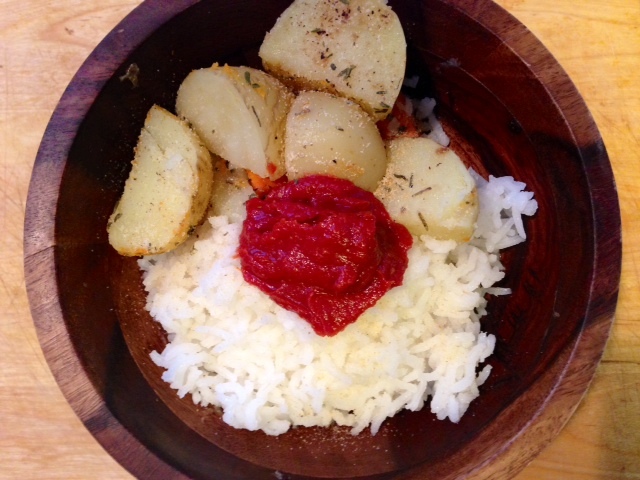 Love using this ketchup traditionally with potatoes as a breakfast, lunch, or dinner entree! Enjoy this delectable fermented condiment! Would love to hear your feedback on this recipe! Very interesting and well said. I am going to go out and a dehydrator for sure. Thank you for sharing as always. I will also go out and get a dehydrator to try this recipe and many more. Thanks A Billion for sharing!! Never mind, I read more carefully and found out the answer! Keep in the fridge, good for a month! You got it Kelly! So excited for your oil free health transformation!